Choosing the right jewelry for every occasion can be a daunting task. With all the fashion magazines filling your head with advice, it can seem impossible to finish an outfit. Different types of jewelry should be worn on different occasions. That much you know. You just have to know when to wear what. If you’re just running errands or meeting a few friends for lunch, there’s no need to deck yourself out with jewelry. A simple necklace, small earrings, and some thin, stackable bracelets will be perfect. Throw in a bangle for a more laid-back look! Men shouldn’t shy away from jewelry. A necklace or two and a bracelet to accentuate your style will add some personality to your look. Need something to spice up your work clothes while still maintaining a professional look? If you work in a strictly professional setting, white diamond (even if they’re fake!) accents will make you look polished with the added benefit of working well with any outfit, regardless of color. A few simple rings will accentuate your look without being too gaudy and drawing too much attention. Thin metal bracelets work well here, too, as long as they won’t make too much noise in an office setting. Stud earrings will brighten your face, without being too much. If your workplace is on the casual side, switch out the white diamond accents for a color that matches your outfit and go crazy with the rings! Men should go with cuff links with matching tie clips and a nice watch in a strictly professional setting. In a casual workplace setting, the watch is still a good idea but add a thin metallic bracelet. Metallic accents look sleek and masculine without being flashy. For women, small pearls as adornments on your jewelry are a safe choice. They’re classy and will brighten up the rest of your outfit! Once again, cuff links, a tie clip, and a watch will pull together any man’s outfit. Add a ring or two to add a little more extravagance. Vintage jewelry can also be a good choice here. Vintage pieces, if chosen properly, will bring a lot of sophistication to an outfit. Since they’re timeless, they can even evoke feelings of nostalgia and are good conversation starters. This is a time to let your personality shine through with your clothing and jewelry choices. Women can wear a choker for a sexier look and some dangly earrings to draw attention to the face. Bigger earrings can make you look thinner, but small earrings won’t get in your way if you want to dance. Rings look nice when stacked, but if you’re afraid you might lose them, it’s okay to leave them at home. For men, a simple necklace and metal bracelets will add some masculine appeal. If you’re just going to dinner and a movie, you want to choose jewelry that will accentuate your beauty, not distract from it. Big, pendant earrings will frame your face nicely, but hoop earrings accentuate every face shape well. For men, wear a necklace with a cool charm. It adds personality to your look and can act as a conversation starter. If your ears are pierced, some metal or diamond studs can be alluring. Did you know that some jewelry can react with your skin, causing you to form a rash? On date night, that could be disastrous. Click for more information about finding jewelry that won’t give you a rash! Women can get bold with holiday jewelry. 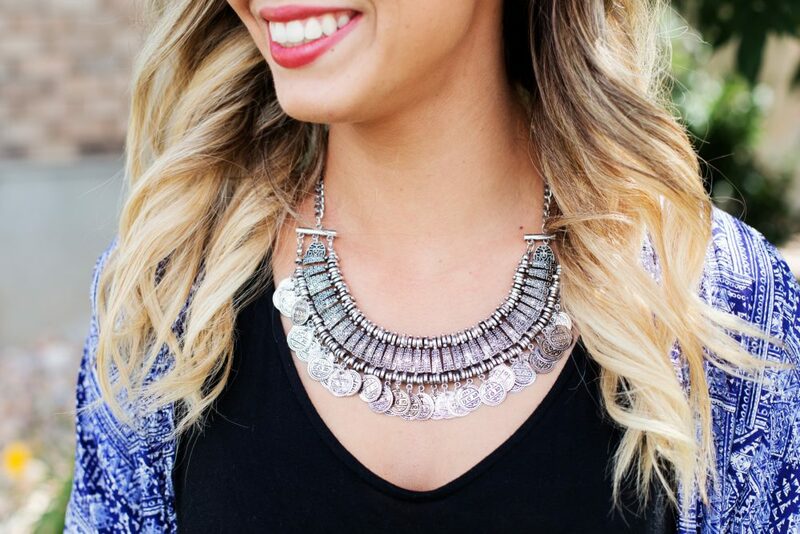 Go for thicker, shinier, more colorful statement pieces. Big, colorful necklaces and bracelets will make you stand out from the crowd. Just make sure the colors you choose go well together. You don’t have to match metals, but gemstones should correspond. Men might want to avoid too many colors, but still, feel free to add personality to your look. A chain around your neck and even a chain bracelet will pull together a holiday look, even if you’re sporting a Christmas sweater. In a formal setting, classy jewelry is your best bet. Drop earrings are the perfect accessory to frame a woman’s face. You can wear statement pieces as long as they’re not too bold. Pearls and white diamonds are perfect for these events but don’t be afraid to add a little color to accentuate your outfit. Men will want to dress professionally here, but feel free to add a little personality. A metallic bracelet or ring will accentuate your look without being too much. Diamond studs are formal enough to wear to formal events, while also adding personality. Maybe you aren’t really going to the Met Gala, but there are some occasions where going all out is expected. Forget removing a piece of jewelry before you leave the house, add one instead! For such occasions, you get to go big and bold to make a statement. Wear big earrings that you wouldn’t dare to wear anywhere else. Pair them with a long pendant necklace that may seem a little over the top when worn together. If you skimp on the jewelry in other places, you could choose a nice headpiece to further accentuate your outfit instead. A small tiara or glitzy headband is perfect for those of you who don’t want to draw too much attention, but still, want to go all out! Men will want to keep it classy and super formal at events such as these. A nice watch, some stud earrings, and a ring or two will add a sense of power to your look. Don’t be afraid to wear a colorful outfit and wear some jewelry to accentuate it! When you’re choosing the jewelry to accompany your outfit, you must remember everything has to go together. It’s okay to have a piece of your jewelry stand out, but the pieces you choose should have a similar style and work well together. Remember to take your outfit into consideration when choosing what types of jewelry to wear. If you’re going with a busy print, it’s better to wear simpler jewelry. When wearing simple colors, be more daring with the accessorizing, unless in a professional setting. Once you decide what jewelry to wear, read this post to see the most recent trends in women’s footwear!